Samsung adds four new portables to its Galaxy portfolio | What Hi-Fi? 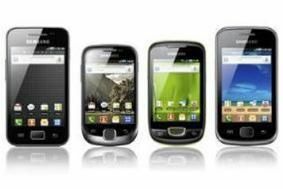 The Galaxy S and Tab are now joined by the Ace, Mini, Fit and Glo. The Ace is a 3.5in HVGA, 800MHz Android 2.2 (Froyo) smartphone topped with a 5MP LED flash-toting camera. It's got 3G and wi-fi, has a 2GB memory and supports up to 32GB of microSD storage. The Mini has only 600MHz of processing power and a small 3.15in screen. On the plus side, it's running Froyo, has wi-fi and 3G data and supports up to 32GB of microSD storage (on top of the 2GB in the box). There's also a 3MP camera. More interesting is the Fit, another smartphone with touchscreen Qwerty keyboard, 600MHz brain, graphics acceleration, plus a 5MP camera, wi-fi, 3G and 2GB of storage (with an additional 32GB support on microSD). Finally, the midrange Glo has 800MHz processing, runs Android 2.2, a 3MP AF camera and has 3G/wi-fi. All of Samsung's new Galaxy models have a TouchWiz user interface and QuickType by Swype. Prices should be confirmed at next month's Mobile World Congress.